The present report uncovers the borderline between homogeneous and heterogeneous water oxidation catalysis using a family of Ni complexes containing oxamidate anionic type of ligands. In particular, the Ni complex [(L1)NiII]2– (12–; L1 = o-phenylenebis(oxamidate)) and its modified analogues [(L2)NiII]2– (22–; L2 = 4,5-dimethyl-1,2-phenylenebis(oxamidate)) and [(L3)NiII]2– (32–; L3= 4-methoxy-1,2-phenylenebis(oxamidate)) have been prepared and evaluated as molecular water oxidation catalysts at basic pH. Their redox features have been analyzed by means of electrochemical measurements revealing a crucial involvement of the ligand in the electron transfer processes. Moreover, the stability of those complexes has been assessed both in solution and immobilized on graphene-based electrodes at different potentials and pHs. The degradation of the molecular species generates a NiOx (Niquel oxides of general formula NixOyHz) layer, whose stability and activity as water oxidation catalyst have also been established. 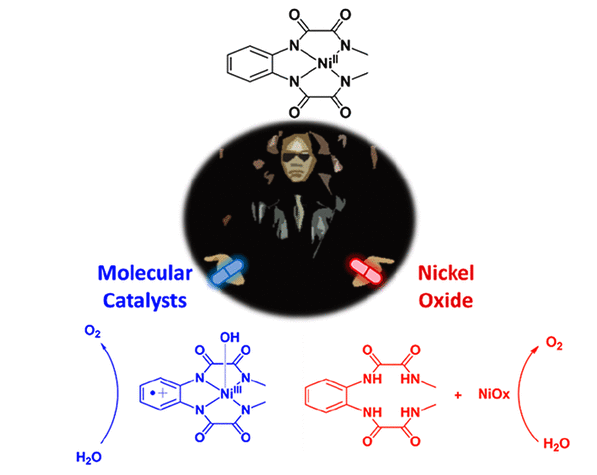 Electrochemical methods, together with surface characterization techniques, have shown the complex mechanistic scenario in water oxidation catalyzed by this family of Ni complexes, which consists of the coexistence of two catalytic mechanisms: a homogeneous pathway driven by the molecular complex and a heterogeneous pathway based on NiOx. The electronic perturbations exerted through the ligand framework have manifested a strong influence over the stability of the molecular species under turnover conditions. Finally, 12– has been used as a molecular precursor for the formation of NiFeOx (Niquel/Iron oxides of general formula NixFe1-xOyHz) anodes that behave as extremely powerful water oxidation anodes.